When we say that we are an auto locksmith, we mean it. We offer comprehensive car locksmith services including transponder key replacement, key fob replacement, car key replacement, and more. Keyless entry has not only given us convenience, but also better security measures. In turn, this has given us greater peace of mind and has lowered the number of break-ins and helped dropped insurance rates. However, like any type of technology, when our transponder keys don’t work or we lose them, these advancements in technology can be frustrating to deal with. For these reasons, the local locksmiths of Affordable Locksmith of Texas offer transponder key replacement and other related car locksmith services, because we would like to help those in Spring have the best security possible and the ease that these types of technologies give. We also know that often when clients try to get replacement key fobs or transponder keys the dealerships tend to charge exorbitant prices. We offer the same high-quality services at an affordable rate. If you don’t see a service listed above that you need then be sure to contact us! We are mobile locksmiths who offer comprehensive car locksmith services. If we can’t help you, we will help you know what your next step. However, there is a good chance that we can perform the service you need! 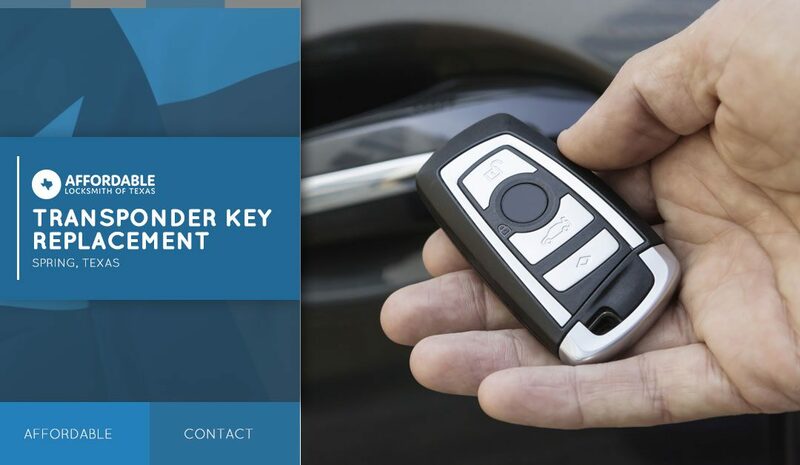 Whether you need key transponder replacement or are simply locked out, our auto locksmiths are here to help you not only get back on the road, but to give you peace of mind that your car and all that is in it is safe and secure. If you are locked out, call us now! We will respond within 15 minutes! First-time clients get 10 percent off their first service! Contact us today for all your keyless entry and car locksmith needs in Spring.